Situated in the North Island of New Zealand, it possesses a landscape that boils, flames and sizzles…. Cauldrons of heated mud that plop like boiling porridge, hissing streams and encrusted mineral terraces, geysers wreathed in steam and boiling rivers — this is a dramatic landscape of emerald greens, flaming oranges and rust reds straight out of a box of crayons. I have driven through a bucolic region of rolling farmland, dotted with a million sheep and cows, large farm houses and finally a tunnel of trees — the Fitzgerald Glade, where shady pongas and shrubs form a gorgeous canopy overhead, cutting out the sunlight — to reach this thermal wonderland. The Maoris have been soaking away their aches and pains in Rotorua’s mineral pools for more than 600 years. But it was only in 1878, that Father Mahoney, a disabled Catholic priest was carried from Tauranga to a spring here, now known as the ‘Priest’s Bath’, and walked back with his rheumatism alleviated. This opened a floodgate of tourists who came to ‘take the waters’. Today, the Bath Museum building (an old Tudor-style bathhouse) looks like it has been transported from England. Rotorua is situated on the Pacific Rim of Fire — a horseshoe-shaped arc in the Pacific with volcanoes and hot springs — where 90 per cent of the world’s earthquakes happen. As I walk through the town, there are constant reminders that under the surface, giant pieces of earth are in constant motion! Sulfurous clouds drift in from the rose garden, steam rises from pavement drains and the Waikite Geyser is the town’s version of a fountain! Its whole volatile beauty is packaged in geothermal parks, where authorised walkways allow us to view, from a safe distance, this wonderland of gurgling and hissing geysers, boiling mud pools, hot springs and steaming craters. I enjoy the Wai-o-tapu thermal valley — a maze of mud pools and geysers that spout at intervals — covering an area of about 18 square kilometres. I see craters with hot water springs and extensive sulphur deposits including the Rainbow Crater named after the tinted veins of mineral and sulphur crystals in the kaolin walls. I am fascinated by thick, inky mud which hisses at regular intervals, appropriately called ‘Devil’s Ink Pots’ because of the graphite and crude oil brought to the surface by water. The pièce de résistance, is the Champagne Pool which reminds me of a wild artist’s palette, with fiery colours splashed around. 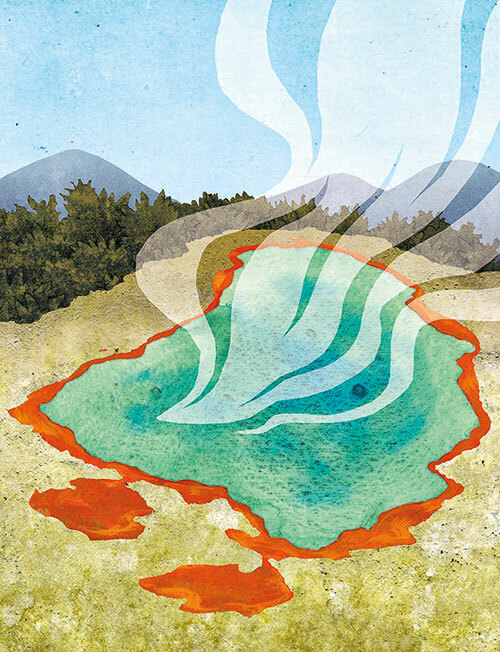 It’s a vast crater of fizzing turquoise water, with a vibrant orange crust, hot enough to poach eggs in. It’s pure chemistry at work with minerals like gold, silver arsenic, thallium and antimony which get deposited in the ledge around it. In the Bird’s Nest, starlings and mynahs nest in small holes in the walls of a collapsed crater where the heat from below rises to incubate the eggs. During the late 19th century, some prisoners were brought from a nearby jail to wash their clothes in a hot pool at Wai-o-tapu. The laundry soap they used triggered the pool to erupt into a geyser. In 1906, the warden had prisoners build a rock spout to drive the geyser higher. Today, the cheesiest sight in this town is the Lady Knox Geyser, which has a large crowd gathered in front of it every morning. It’s like waiting for the magician to start performing…there’s a daily injection of soapy surfactant which breaks the surface tension and unleashes the creative power of Mother Nature. With theatrical effect, the geyser pops out to cheers and camera clicks from the audience! My favourite though is the lush Waimangu Volcanic Valley, the world’s youngest geothermal park, (it was created by the eruption of Mount Tarawera in 1886 which was so violent that its lava flow buried an entire village). Waimangu means ‘black water’ in the Maori language, referring to the water that was thrown up by the geyser. We explore the valley and its iridescent crater lakes as well as the flora and fauna on an ‘easy trail’ with our genial guide. The tour is interesting because of his inputs — he points to silver ferns, the national symbol of the country and to the Inferno Crater with its amazing turquoise attributed to silica deposits. The emerald pool with moss, algae and the native floating fern azolla has shades of blue, green and brown and changes hue with changes in the plant species! At the Hot Water Creek and its springs I sense the volatile nature of the earth below me: white steam hisses above the surface and the minerals along the edge stain the ground orange, yellow, brown and green. There’s more to Rotorua than its geothermal activity. The hot pools attracted the early Maori settlers around the lake where they used the water for cooking and built their houses on warm ground to beat the cold winters. Today, it is the centre of Maori culture with a huge native population. To get an insight, I visit the Tamaki Village, started by two Maori brothers, that showcases crafts like weaving and wood-carving, music, dance and food. We are greeted with the traditional ‘hongi’ greeting — touching noses — and the spirited Haka dance where Maori men with tattooed faces stick out their tongues and indulge in a fierce stomping session. We visit some whares or traditional homes to learn more about the Maori way of life since they first arrived in Aotearoa (Maori name for New Zealand) one thousand years ago in their enormous waka (canoes). With all the walking I work up an appetite for my first hangi meal. A hole is dug in the earth and food is placed in baskets on hot rocks. I am treated to chicken, pork, potatoes, pumpkin and a few other vegetables like sweet potato, all cooked beneath the earth. This is a traditional method of Maori cooking that dates back many generations, and is still used today in various communities.